"Established over 11 years ago, Curbside Motors has taken great pride in becoming your local garage... This friendly, professional garage offers a variety of services all of which are carried out to the highest quality and most competitive prices around. Our professionally trained technicians are on hand to help you with any mechanical problems you may have, no matter how big or small. The garage is equipped with the 3 workshop ramps and offers everything from major repairs to prepairing your car for it's MOT's. 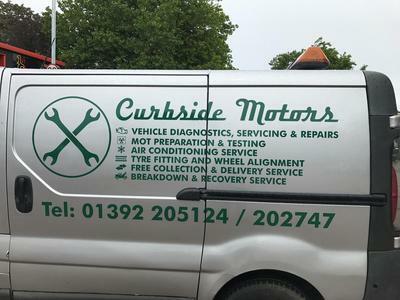 If your really stuck in a jam then our Breakdown Recovery service is on hand to help get you back up and running as soon as possible, what's more we also offer a FREE collection and delivery service - Hassle free motoring is easy with Curbside."